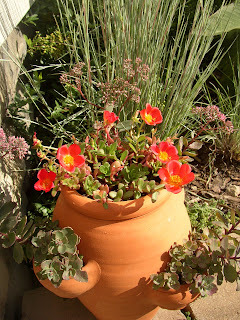 I have been reading about it in several different garden blogs, and that August Itch has finally bit me, too. Hard. I don't know if there is a "real" name for it, but you know what I mean. It's that time of the year when those areas of the garden we called "lush" earlier in the summer now just look like a jungle--in a bad way. It's the downtime between the bountiful blooms of summer and the start of autumnal tones and elegant decay. It is now that I look out over my eclectic garden and wish that I instead tended a regimented, formal parterre. Or a soothingly austere prairie-style planting. Maybe a zen garden. I finally succumbed yesterday and started to scratch my itch. 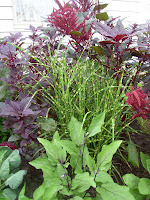 Much of the self-seeded red amaranth was ripped out and composted. 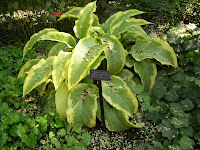 'Othello' ligularia was moved (yeah, while it was blooming) to a spot where its rounded, large leaves are needed to break up the finer foliage of goatsbeard and grasses. Hakonechloa 'All Gold,' picked up on clearance, was placed in a corner where it can glow--and cascade over nearby retaining wall blocks. Japanese bloodgrass--happier here in the rich, trucked-in soil of the back garden bed than it ever has been in the barren dirt of the front bed where herbs and other tough guys like yarrow thrive--was divided into more clumps. 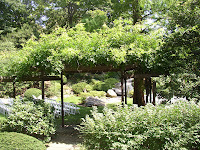 The blue hosta in the foreground moved between two of them and the hakone grass. Several different relocation options for the Russian sage are under consideration. Clusters of 'Chocolate Chip' ajuga were broken up and spaced apart in the hopes that they will grow back together to carpet the garden floor. The gaping hole in the bed, where the 'Diablo' ninebark used to be, is now the home of the dwarf tart cherry tree that I should have planted there in the first place. Finally, this area of the garden is starting to look like something. But even as I remind myself of my vow to try to Leave Well Enough Alone in the coming year, and give things time to settle in and grow... still, I feel that itch. 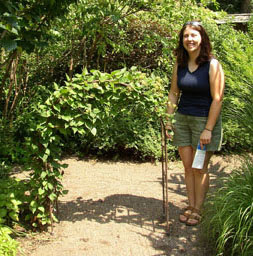 Taken at the Cleveland Botanical Garden August 4, 2007. Nate is one of those friends who drifts in and out... sometimes we see a lot of him, sometimes we can't get a text message back from him at all and are left to wonder where he is and what he's doing. Today he came over to hang out and catch up, which is always a good time. "I know I haven't been here in a while," was the first thing he said to me, "But I wasn't quite expecting the nice little jungle you've added to the backyard." Nate meant that as a compliment, but it made me laugh just the same. Jungle? Au contraire, Nate--you were looking at the veggie garden! Well, part of the veggie garden, anyway. 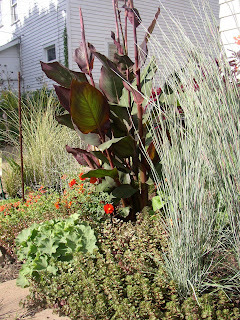 See the blue leaves of brussels sprouts peaking out from behind the Little Bluestem, just to the right of the 'Red King Humbert' cannas? 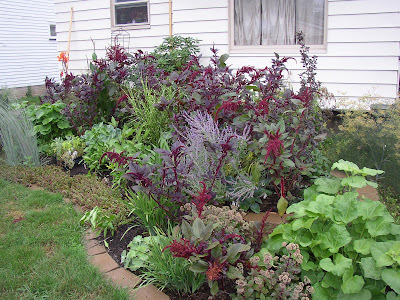 There are 'Ichiban' eggplants behind them and a row of various late-planted peppers spaced out evenly next to the 'Fuldaglut' sedum that edges the bed. 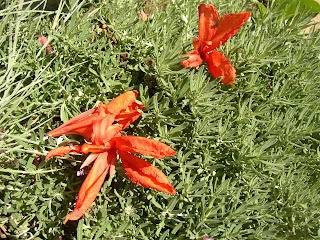 The 'Hopi Red Dye' amaranths that you see popping up throughout the bed are edible, too--you can use the younger, more tender leaves like spinach. Some veggies are just so pretty that I think I will always be able to find a place for them in the yard. And some of them, admittedly, look rather exotic. 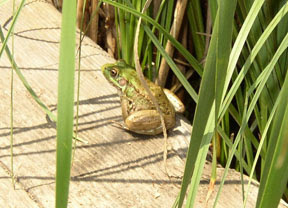 The purple-tinged eggplant leaves are one example. And the red okra that I plan to grow next year is another. That various grasses and low-maintenance perennials like 'Matrona' sedum, Siberian iris and Russian sage mix well with them is a bonus. On the one hand, this post is an ode to the beauty of veggies and is meant to show that all vegetable plants do not have to be relegated to a square plot. 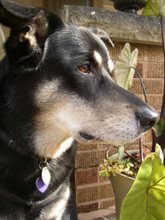 On the other hand, it's also in response to Chuck's desire to see all of our gardens from other than the usual "closeup" perspective that we tend to show on our blogs. On the third hand(? 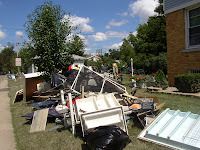 ), this is also a "before" picture of a bed that's going to be totally revamped this fall. 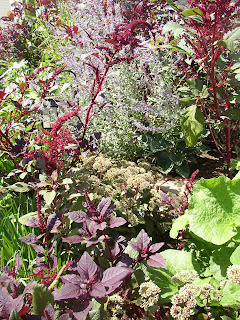 For one thing, I allowed the amaranth way too much leeway--artful clumps would look much better than all of that self-sown randomness. I have finally decided on a square lawn instead of the irregularly-shaped one that I have now, so more grass will be taken away and the area in front of the cannas will need to be redesigned to accommodate the new shape. The 'Morning Light' and 'Little Zebra' miscanthus grasses that you see beyond the cannas, still in their pots, will need to be included here. I kind of like the way the 'Morning Light' and the Little Bluestem look bookending the cannas in this picture, so I may have to work that into the design somehow... but all of this design talk is mere conjecture at this point, really. I need to get out there, mark off the new bed, and take some measurements so I can actually start to design this area the right way. For once. See, I would like to be one of those ultra-organized people who draws everything out on paper and then follows the plan to the letter, but sadly I am not. Instead I have a very good idea of what I'm going to do ahead of time, but make lots of changes--lets call them adjustments, that sounds more positive--as I start to dig. I always wonder whether my fellow garden bloggers and garden blog readers have plans that they follow, or whether they just bring plants home and plop them anywhere they have space... or somewhere in between. Anyone out there reading care to comment and appease my curiosity? The Hershey Children's Garden is a magical place, and it is open to children of all ages--as the docent was quick to reassure us when we inquired whether "we adults" were allowed to enter. That may have been true, but there were many features (like this vine-covered arch that Amy was nice enough to pose beside, to give a sense of scale) that were strictly designed for the smaller set. I'm glad that I didn't have to miss the opportunity to visit this wonderland... and I'm also glad that there weren't too many people in the garden that day. The kids may have understood, but their parents would likely have rolled their eyes at our exclamations of delight as we explored this little paradise. A small station at the entrance to the garden shows several cut flowers in small bottles, which children are supposed to look at, remember, and then find in the garden as they explore. A sundial in the patio floor there allows you to stand in the center and use your own shadow to determine the time--and all birthdays are listed around the outside of the sundial. (The docent said that the kids just love to walk around and find their birthdays here.) There is even a maze in the garden... an entrance to what looks like a stand of arborvitae reveals itself as you walk past. The path winds you into the center of the stand, and then winds you back out near the exit. The huge treehouse at one end of the garden beckoned us first. It spanned a change in elevation, so you could walk up a hill to enter through the back door of the second floor, or you could start at the bottom and climb the stairs. We chose the former, and on the way up the hill we passed an educational station about water gardens. The trough full of water and plants included these instructions: "We are water hyacinths. We float on top of the water. Pick us up and look at our roots." Who could resist obeying? Not me! 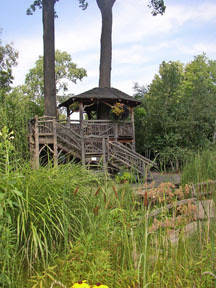 The treehouse was fun, with a potted "root beer plant," benches to sit on and books to read. 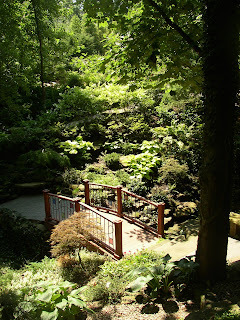 As we exited the stairs, we were drawn toward the pond garden with wooden walkways at its base. 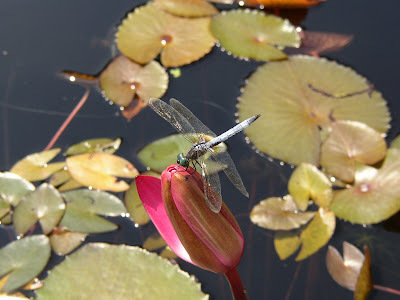 Several children were crouched near the water's edge, squealing with delight as they pointed out the golden koi navigating around waterlilies and cattails. I didn't quite feel right about taking pictures of someone else's children, but I did get a picture of someone else enjoying the wooden pathways--just before we got too close and caused him to jump back in. Next we discovered the kids' version of the kitchen garden. Lots of herbs, veggies, and instructional signs here... along with a kid-sized garden shed that had the loveliest door I've seen in a while. 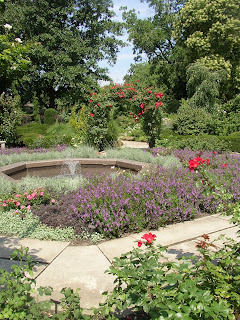 The plantings here were meant to entrance kids by attracting butterflies, introducing them to new scents and flavors, and providing a general sense of awe. We were pretty entranced ourselves--especially after the docent told us that we were welcome to eat any ripe berries that we could find. Those, apparently, are for children of all ages, too, but we only managed to spot one inky beauty. Since I have my own blackberry bush at home, I allowed Amy to enjoy the whole thing in spite of her offer to "go halves." 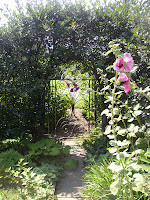 The garden is not just about enjoyment, however. There are learning opportunities around every corner. A vermicomposter sat near the spot where kid-sized stepping stones embedded with everything from marbles to tooth-marked Legos were set out to dry. It had been part of that day's activities for those children who joined the educational lesson series there. 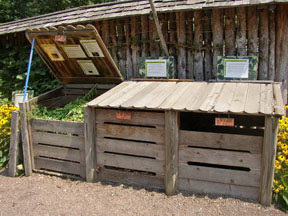 Elsewhere, a 3-compartment composting station explained the stages of making "black gold," (yes, their sign really said that!) from Beginning to Working to Finished. In case you couldn't tell, this was one of my favorite places at the Cleveland Botanical Garden. All children (of all ages) should have the opportunity to experience such a fantastic place! After our visit here, we needed to take a quick break to sit down and enjoy some refreshment at the garden cafe. Time to recharge between wonderlands: The glasshouse, showcasing the spiny desert of Madagascar and the cloud forest of Costa Rica, is up next. 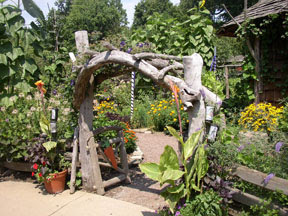 The "Theme Gardens" at the Cleveland Botanical Garden are those built for the most recent Flower Show. 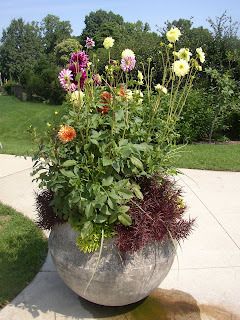 This year's theme was "Rhythm & Hues," with each garden designer taking a very different approach. There were structures where water cascaded off of the roof and onto drums below and whimsical fountains where water poured out of the mouths of musical instruments. 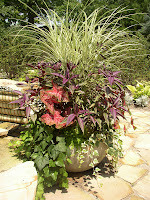 At this time of the summer, most of the theme garden plantings are not flashy. 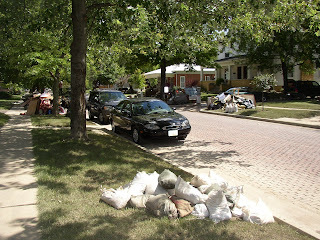 It is now when the interest provided by leaf color and texture, along with hardscaping, makes a huge difference. 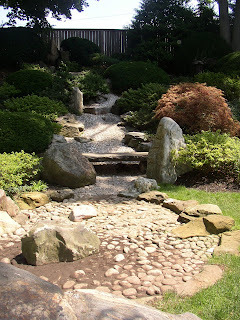 What struck me most as I explored this area were the ideas that I could take and apply to my own garden. These theme gardens reminded me more of a "real person's" backyard garden--albeit a very beautiful, well-design one. I could imagine this gorgeous container anchoring the corner of my garage... unfortunately, it wouldn't have fit into my car! 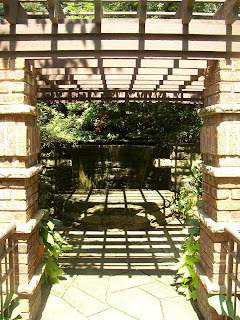 One garden featured a seculed patio with a water feature in which water spilled down a concave wall. A semicircle of stone in front of the feature seemed to complete the circle visually, and the whole patio was refreshingly cool thanks to a combination of mist and leafy cover. I took this picture of the entrance to the patio, but it wasn't until I went home and studied it that I realized why I appreciated it so much. I love the repetition of rectangular patterns in this patio entrance. In the midst of the more organic forms that populate the botanical garden--and in contrast to the circular water feature inside--these straight lines added an orderliness that was somehow very relaxing and comforting. Using tall timbers as the lowest level of overhead beams in the arbor here was fantastic. It allows the squares revealed by the sunlight on the floor to be repeated on the "ceiling" as well. In effect, it looks like perspective lines have been drawn to pull your eye toward the water feature inside. The bricked columns on either side continue the rectangular theme but add a nice vertical and a sense of arrival as well. 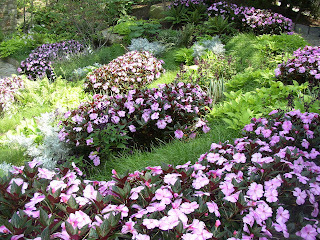 The "Opera Hortensia" was definitely one of the more colorful theme gardens. 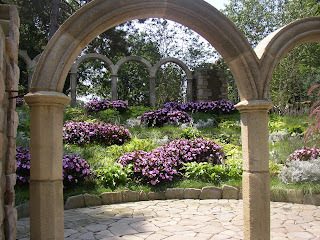 Two curving walls of arches bookended the garden, with an open area near the lower wall that evoked a stage. A patchwork of plants swept across the curving slope, giving the feeling that each plant grouping was a separate party of viewers settled in to enjoy an evening concert. 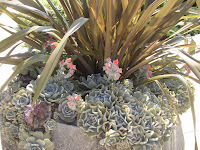 The seemingly random clumps lent a nice rhythmic feel to the planting. 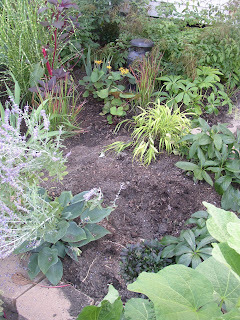 The planting wasn't overly dramatic... from above, it just felt nice in a quiet kind of way. You can see what I mean in the first picture. The last theme garden that I want to highlight was this sunken woodland gem, designed by The Pattie Group. The pathway meanders down the hillside through the wild-seeming plantings. 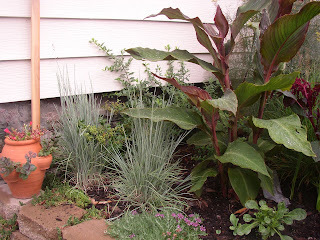 Large-leaf hostas and ligularias contrast with other fine-textured plants and random rock outcroppings. Sunlight snakes through this garden via a break between stands of tall trees. I might have just been here at exactly the right time of the day and year, but you can see that the sunlight patterns are highlighting the subtle river of yellow-leaf plants (including large hostas) that they planted to "flow" down the hill in an accidental-looking way. I can't believe it's accidental, though, and it got me to thinking about how I could better take advantage of the patterns of light in my yard. As I sat on a rather conveniently placed large stone in a small landing area, I lamented the fact that I have a level yard. There were so many beautifully used changes in level here. 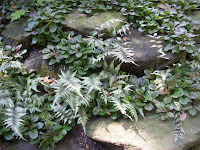 But I did take some inspiration from the ajuga and ferns planted within a collection of rocks behind the natural bench. 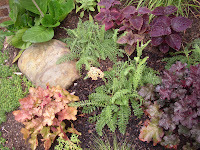 You don't need large levels to tuck some of these smaller plants into groupings of rock and dirt artfully--I think that I could arrange this on a smaller scale at the back of my lot, beneath the grape arbor. As we left the cooling refreshment of this last theme garden, Amy and I felt a little bit tired... there had been so much to take in. Luckily the Hershey Children's Garden awaited around the bend, full of excitement and a return to the energy and enthusiasm of childhood. Stay tuned for a tour of that garden, which will probably be posted later this weekend. I wasn't quite sure what to expect from my garden in August. All gardens seem to look great in June and into July--and I love mine in September, when it starts to show the beginnings of fall color--but August seems like a rather tough time of the year. 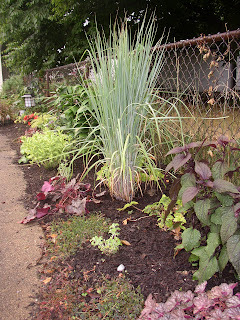 Many perennials have finished blooming, annuals are getting scraggly and need to be cut back, and plants in general always look a little worse for the wear in our typical August heat and humidity. 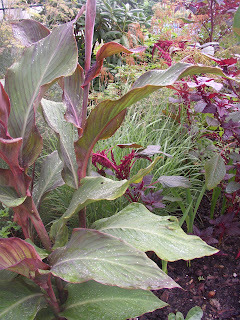 Maybe that's why I love my 'Hopi Red Dye' amaranth so much. This stuff looks good all season long, with just the occasional hard chop. 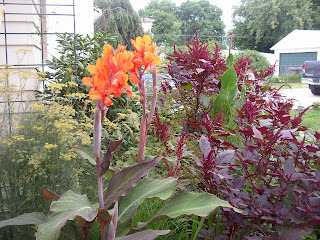 That it pairs just as nicely with the cool purple of Russian sage as it does with the warm oranges and reds of canna lilies doesn't hurt, either. 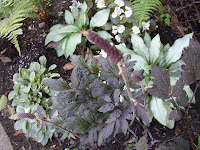 In the second picture you can see the amaranth on either side of the lemony-striped Miscanthus (either 'Zebrinus' or 'Strictus,' my aunt and uncle didn't keep the tag) and the purple-tinged foliage of the 'Ichiban' eggplant. 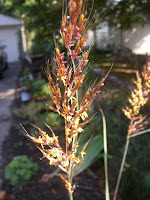 I think I'll cut it back a bit more, though, since it's looming a little ominously over the zebra grass! 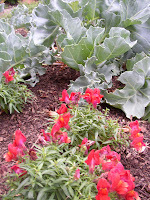 Similarly, I appreciate the carefree nature of snapdragons. These annuals sometimes overwinter for me, and I really like the taller varieties, but this year the only reds I could find at the garden center were short. I think that next year I'm going to start some old-fashioned ones from seed--and for this, I blame Elizabeth. I like my red snaps next to the glaucous leaves of sea kale, and in another part of the garden I have some snuggling up between blue-tinged hellebores with red veins, and golden oregano. The latter looks more chartreuse than golden at this point of the summer, but it still compliments the yellow throat on these snaps in a good way. I have read several times (but first in a Tracy diSabato-Aust book) that one should keep the entire color spectrum in mind when placing plants together. The idea is that you get the most pleasing effect when colors from the far end are a darker shade than those at the near end. I believe that Tracy's example was that apricot goes well with dark blue but dark orange doesn't go so well with light blue. 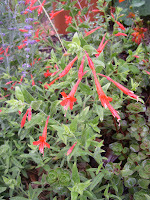 She would not like my snapdragon and sea kale combo above, nor would she like the 'Orange Carpet' zauschneria garettii (aka hardy or California fuchsia) cozying up to the Russian sage here, but I do! I understand the concept and agree with it for the most part... but I also wholeheartedly believe in bending the "design rules" when it makes you happy. 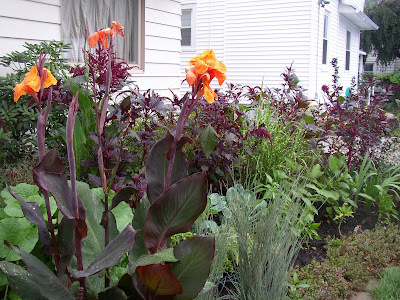 I do NOT always like it when plants decide to bend design rules for me, as is the case with the orange cosmos and dark-leaf canna here. 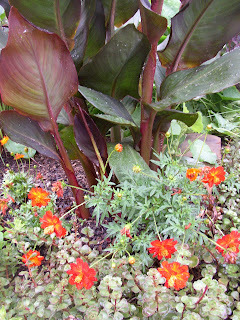 The cosmos was supposed to be a little bit taller, and the canna was supposed to stay a little more dwarf. Instead, there is quite a large visual step down between the two. Shade is at a premium in my garden, especially since the neighbor limbed up his beautiful beech tree last week, but there are a few interesting things blooming in the more light-challenged areas. 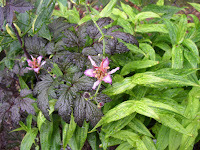 Here, one toad lily bloom jumps in front of the dark foliage of 'Hillside Black Beauty' cimicifuga/actaea and the gold-flecked foliage of a different toad lily. Both toad lilies are still in their nursery pots, as I am "trying them out" here next to the bugbane... but I think this is a fun combination, especially with the shiny European ginger at their feet and a large 'Frances Williams' hosta next door. 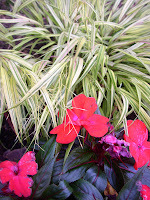 I have decided that New Guinea impatiens are probably too fussy for me to bother with next year unless I keep them in pots where they will be easier to remember to water. That said, I love the dark foliage on these (Something-Cherry is the name) and they look great next to hakonechloa macra 'aureola.' 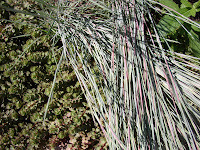 The variegated Japanese forest grass is sprouting its own airy inflourescences, and the blooms on the New Guineas help pick up the beginnings of the pink fall tinge on the grass blades.